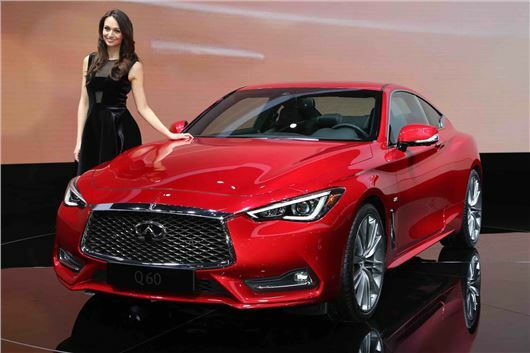 Infiniti continues to play David to the gang of German Goliaths with the launch of the Q60 Coupé in Geneva. It’ll cost from £30,000 or so when it hits Infniti’s lovely, spacious showrooms later this year. True to form, instead of appealing to the parsimoniously minded buyers that make the BMW 420d sell so well, Infiniti is spearheading the Q60 with a 3.0-litre V6 twin-turbo version packing 400PS and unlikely to exceed 22mpg in day-to-day use. So equipped, the Q60 Coupé is officially rated at 26.4mpg. The car does have a newer version of the company’s occasionally maligned steer-by-wire Direct Adaptive Steering though, which should see it behave in a more natural manner than cars equipped with the first-gen system. A seven-speed automatic transmission is standard, and although the full UK specification isn’t announced yet, it’s likely to mimic that of the Q70 saloon. That means a 2.2-litre diesel with 170PS will make up the majority of the dozen or so Q60s actually sold in the UK, promising economy in the mid-fifties. This will be one very well equipped coupé, too, with touchscreen navigation, Bluetooth, DAB, leather upholstery, dual-zone air conditioning and 18-inch alloy wheels all a given. The Q60 Coupé also features active noise cancellation, designed to prevent the diesel chunter (or V6 thunder, as the case may be) from spilling into the cabin.